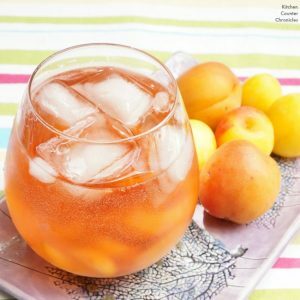 A delightfully deliciously refreshing summer drink, rose sangria spritzer with apricots and plums. Pour a bottle of rose into a glass pitcher. Prepare the fruit. Feel free to use peaches and nectarines…whatever fruit is in season where you live. We picked up our plums and apricots at our local farmers’ market on the weekend. Wash and cut a shallow “x” in the bottom of the fruit – preparing the fruit to have its skin peeled the skin. Pile the fruit into a heat proof bowl, I like using my pyrex measuring cup. Cover fruit with boiling water, this will loosen the skin. When the skin begins to fold back, remove the fruit from the water and use your hands to peel off the skin. The plum skins came off easily, while the apricot skins didn’t. So, I left the skin on the apricots. Now, slice the fruit and add the fruit to the pitcher of rosé. Set aside in the fridge for at least 1 hour to let the fruit seeps into the rosé. Pour a healthy amount of rosé sangria into a glass – leave enough room for a splash of club soda. If you’d rather skip the bubbles, then leave out the club soda altogether. If it’s really hot out, don’t be afraid to add a couple of ice cubes to your glass. Feeling really dedicated? Use another bottle of rosé to make a tray of rosé ice cubes – thus not “watering down” your glass of rosé.